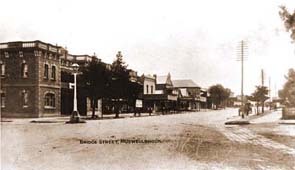 A photograph taken in the late 1800s. A photograph taken in the 1970s. When you arrive in the Muswellbrook area, you are struck by the lush Hunter River flats, so it is no wonder that land grants in the area were eagerly sought. In the early 1820’s the first of the explorers and surveyors took the news back to Sydney, and one of the first to take up land there was Lieutenant-Colonel Henry Dumaresq. He turned his property, St Heliers, into one of the finest on the Hunter. He was the brother to William Dumaresq, of St Aubins, Scone, and brother-in-law to Governor Darling. He had a sizeable house built there, and established a beautiful garden, with a vineyard, and these became a show piece. Skellator was the grant to the colony’s first Chief Justice, Sir Francis Forbes, in 1825. It was later sold to the Bowman family, who built themselves a grand home there. The Forbes sons created Forbestown on part of this land - it is today’s South Muswellbrook - while the Roman Catholic Church own the former residence. Edinglassie, on the Denman Road, was taken up by George Forbes, a brother to Sir Francis - he settled there in 1824 (although it wasn’t granted until 1837). The Whites came into possession of it initially when James C. White purchased it in 1838. 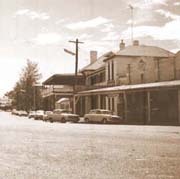 Merton was taken up in 1825 by William Ogilvie, and it became the centre for all administration for a time, until this moved to Muswellbrook and superseded Denman (which had superseded Merton). 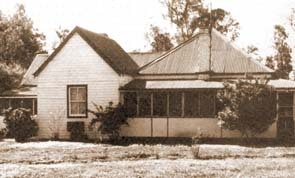 In 1826 Capt Samuel Wright took up the land, which was known as Bengalla, and turned it into a fine property. After his death in 1852, it was sold the following year to John Hudson Keyes, and it stayed in this family until sold to the mining consortiums in the mid 1990’s. 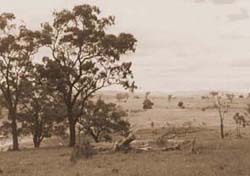 James Brindley Bettington took over the properties of Piercefield and Martindale in the late 1820’s, and eventually acquired large holdings in Merriwa. Descendants of the family are still on some of the original land holdings there. Kayuga was granted to the McIntyres in 1820’s, and this also remained in the family until recently. Royal Hotel, Bridge Street Muswellbrook 1930's. Now the National Australia Bank site. Cruickshanks have a winery there. 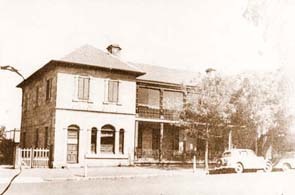 The Royal Hotel, which was the first two storey building in the town, was a solid and imposing edifice of local sandstone. It was owned and run by Henry Nowland, and Governor Gipps was even reputed to have stopped there for an overnight sojourn. 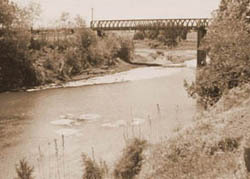 Henry Nowland came to own most of the town land on the north side of Muscle Creek, while the Forbes family owned that on the south side. A Post Office was established in 1837, and in 1839, a mounted police barracks was erected, and by 1848 the town was able to boast 48 houses, a courthouse, a steam flour mill, a boiling down works, several churches, and a population of 108. In 1869 the railway arrived and the original charming railway station building is still there in Market Street. 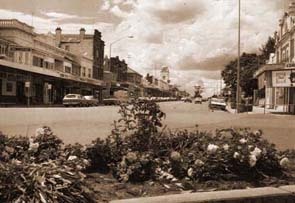 By 1870, the number of residents in Muswellbrook had increased to 1444, and it was gazetted as a town. The town received electricity in 1922 and the wife of the then Mayor, Florence Parkinson, switched on the lights for the first time. Luscombe Chambers, opposite the post office, was for many years the only 3-storey building in the main street. It was built by an early Mayor, and now houses real-estate offices. The department stores of Campbell and Co were established all through the Upper Hunter, by Malcolm Campbell from the 1870’s onwards. Now only the buildings remain - in Muswellbrook the former store (and head office) is on the south-western corner of Bridge and Brook Streets. Other interesting old buildings in Bridge Street are Loxton House, Weidman's Cottage, Eaton's Hotel and the Post Office. Atherston, Biralee, Balmoral and Kanoona are some of the attractive private homes remaining in the area, while St Albans Church of England, St Johns Presbyterian and St James Roman Catholic Church are all worth seeing. In 1908 coal was discovered on the town common by Mr Harry Jeans. This led to the formation of the original Muswellbrook Coal Company. The huge open cut, which led to so much coal being mined in the area, can still be seen on the north eastern edge of town. Many more discoveries of coal have been made in the area since, including on the former Dumaresq land of St Helliers. There have been several theories about the origin of the name, Muswellbrook. The most probable was that the name Muscle Brook was given to the district by the first settlers, in consequence of their finding a number of shell fish resembling muscles in the Creek.' The town was gazetted as Muscle Brook in 1833 but Muswellbrook appeared in the New South Wales government Gazette in 1838 and although it came into general usage, it was not officially approved until February, 1949. A photograph taken circa 1975. A photograph taken circa 1975. Houses have since been built on this spot. Muswellbrook is an attractive country town, which still retains a lot of its historic buildings, and some of these can be seen by a casual visitor driving down the main street. The town is situated beside the Hunter River, and is 257 km north of Sydney. It is an expanding centre due to the employment opportunities provided by the eight coalmines in the district, and the presence of the Liddell and Bayswater Power Stations to the south. In more recent times, we have seen the development of a flourishing wine grape industry. As a consequence, the population of the shire has increased from less than 7500 in 1975, to over 18,000 in 1999. Muswellbrook continues to fulfill its role as a service centre to the dairying and agricultural activities of the surrounding areas, and also still supports a significant number of horse studs, dairies and wineries.